When homeowners see wood floors being refinished, there are usually a lot of questions. 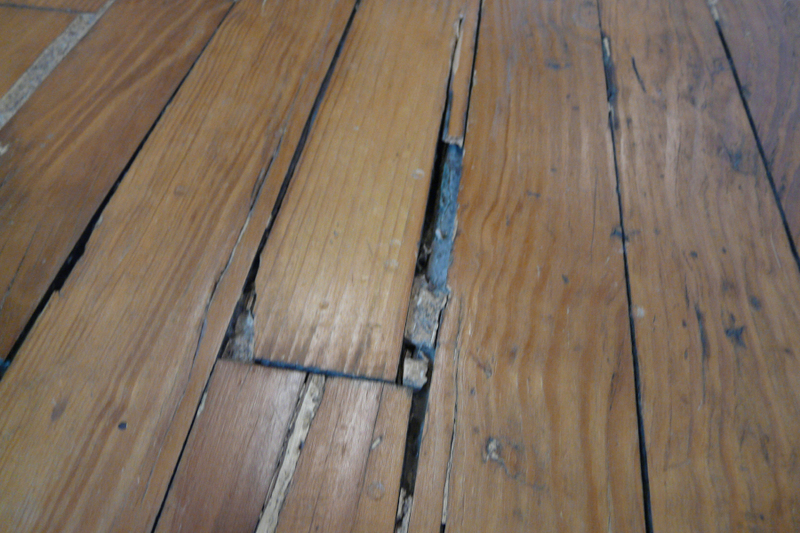 With older homes, one of the most common questions concerns the linear cracks that parallel the direction of the wood. They don’t get a lot of attention until you get old finishes and stains off the surface and then you can see the dark lines because of how they contrast with the lighter wood. At this point, some homeowners get somewhat fixated on the color disparity and the crevice they see and want to take action. My advice is ask the right questions before you begin. Where Did the Cracks Come From? First, this separation is perfectly natural for older homes. You often see settling of exterior (and sometimes interior) walls and this action will pull the wood apart. Another location is around areas with a lot of weight, like hearths around a fireplace or a staircase. Again, the weight or pressure will pull the wood apart. A third cause is what is known as “compression set”. Compression set occurs when the wood takes on excessive moisture and swells up. This forces each piece of wood to push against its neighboring piece. As the wood dries and loses its high moisture content, it begins to shrink and the gap starts to appear as each piece has shoved the adjacent piece away. This can be a pretty destructive event and I have seen moist expanding wood cause cracking of handsome marble or stone hearths. There is tremendous force there and you just don’t want to get in the way. Now that you have the separation, the question becomes “what do you do?” The knee jerk reaction is to fill the void with wood filler of some type. In theory this is the best way of making the void more acceptable. The wood filler goes into the opening wet, then dries and hardens and any excess is sanded away. Problem solved. . . right? Well, not exactly. Are We Really Solving a Problem? This is when reality settles in and you learn that wood never stands still. Either because of moisture, sunlight, or heat and cold, wood continues to move. Even in houses that are well built, well sealed and where the interior environment is carefully controlled, this will happen. The variations are very slight but the outcome is the same. As far as the wood is concerned, the filler is in the way. So it will crush and pulverize the filler and the filler will begin to disintegrate. This will not stop and at different times of the year, it will be accelerated. Slowly, the crack or gap will begin to re-emerge but now it will have the look of the mouth of a seven year old as their teeth begin to fall out. It is not a pretty sight. Various manufacturers have made claims they can withstand this onslaught but I have yet to see one endure this punishment. My advice – leave it alone or get a highly skilled carpenter involved. Another occasion where filler seems to be the appropriate route to take is when you have major splitting from excessive sanding. This is very different from the previous condition and is illustrated in the adjacent photo. We are no longer talking about linear separation between boards; we are talking about large voids created from hunks of wood disappearing during or shortly after sanding. Again, the knee jerk reaction is to fill it. The results here usually don’t last long at all for two reasons. First, there is the lack of support for the filler. It doesn’t have the mass beneath it to stay in place. Second, there is typically much more movement of the wood as the tongue and groove that is disintegrating is the mechanism that kept the wood in place. The movement due to pressure from foot traffic and furniture will demolish the filler in very short order. This is one of the strongest arguments for limiting aggressive sanding on old floors as the results can be disastrous. There is a time and place for using wood filler and we use it a lot. However, we need to know the long term consequences of filler being used incorrectly or for the wrong reasons. You may get less than desirable results or create a more unsightly looking floor.